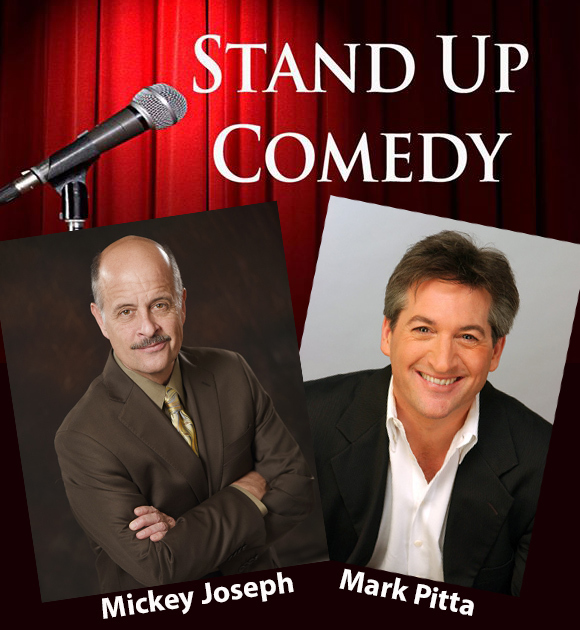 Comedians Mickey Joseph & Mark Pitta – January 20, 2018 at the Convention Center downtown. Tickets will be $18 in advance and $20 day of show. Table reservations will be available so get some people together and make a plan! MUST be at least 21 years of age. He was raised in the San Francisco Bay Area where he attended the Catholic School which influenced what would later develop into his unique style of Physical comedy which includes, bobbing, weaving and most importantly, pleading for Mercy. Mickey left his loving home to attend the American Academy of Dramatic Arts in Pasadena. He rented a small room in the home of an East Indian family. To support himself, he waited tables in an Italian restaurant. One night, after observing Mickey’s tableside antics, celebrity impressions1 and roll juggling, his boss suggested that he dive into show business. Or any business other than his restaurant. Heeding this loving advice, Mickey entered the world of Stand Up Comedy. He moved to Hollywood, joined an improv comedy group, and began to write and perform his act. He married, fathered two beautiful children, and divorced, all in one sentence. He returned as a single parent, to the San Francisco Bay Area, where be quickly became a favorite in some of the most well known comedy clubs in the country. Mark’s career flourished in LA, first, fulfilling his dream of appearing on The Tonight Show with Johnny Carson then subsequent appearances with Jay Leno. Mark landed a job as host of Totally Hidden Video for the FOX network, playing different characters in hidden camera situations and then hosting Friday Night Videos for NBC. Mark has made guest appearances on Mad About You and Third Rock From the Sun. For Comedy Central Mark has appeared on Premium Blend; The A-List; Dr. Katz; and Make Me Laugh. Mark wrote and starred in his own sitcom for NBC but the pilot wasn’t chosen for the fall season. Head of NBC, Warren Littlefield picked a show called “Union Square” instead. It lasted three episodes. Mark predicts that his show would have lasted at least four. When the word came down that the project wasn’t a go Mark magically received a call from the top rated morning show in the San Francisco Bay Area to be the roving entertainment reporter/host. For five years Mark brought his unique comic expertise to the man on street format and enjoyed the original approach to interviewing newsmakers, movie stars and everyday folk. In 1997 Mark achieved the comedy version of the hat trick when, during a show, he made a women (name withheld) laugh so hard she wet her pants, cried, and liquid came out of her nose. There is no higher honor. A favorite on the comedy club; college; and corporate circuit, Mark has also opened for Chris Issak, Celene Dion, Vanessa Williams, Paul Anka, Kenny Rogers, Olivia Newton John, Smokey Robinson, Big Bad Voodoo Daddy, and Rick Springfield. The prestigious ELAN AWARDS has chosen Mark as Master of Ceremoniesfive times, and Anthony Robbins has employed Mark to liven up his financial seminars. Every Tuesday in Mill Valley, Ca. Mark runs a comedy showcase at the 142 Throckmorton Theatre new comics a chance to develop. Veterans like Dana Carvey, Robin Williams, and Richard Lewis have also stopped by. Read more about it at www.MarkPitta.com. When not working for money, Mark lends his time to his favorite charity, The Tony La Russa’s Animal Rescue Foundation. WIN DOWNTOWN DOLLARS and more! Starting November 28th there will be elves hiding in different downtown businesses. Help us find out who is spending the month in which location before Christmas (game ends December 24th)! So how do you play you ask? Don’t worry it’s not a tough task! Come downtown and start searching around, there are 13 elves that need to be found. Each participating business will have cards listing their fellow merchants whom are hosting an elf. 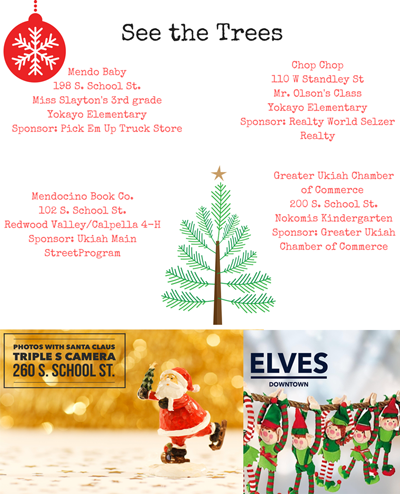 ​Once you have completed the list of names (elves will have name tags) matching the location, leave the card at ​the Visit Ukiah desk in the Ukiah Valley Conference Center, 200 S. School Street for a small treat and be entered to win gift cards to places downtown or a gift basket ! Have fun! hashtag a photo #elvesdowntown for another chance to win. Take a walk downtown and see all the fun festive windows. We are happy to share some trees decorated by children! Who’s been Naughty or Nice? Come meet St. Nick and make the holidays special with Santa and me photos. 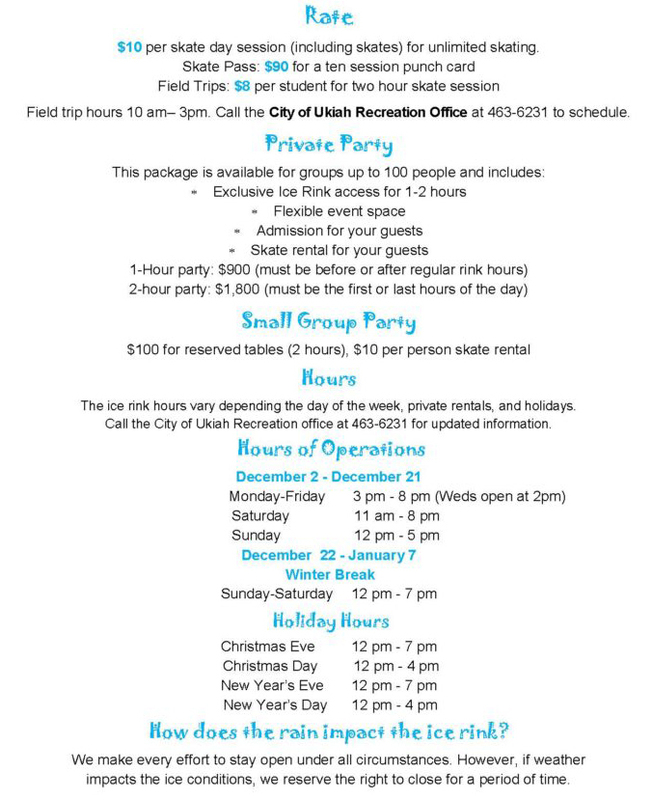 Hometown Holiday Ukiah! See what else is happening here! 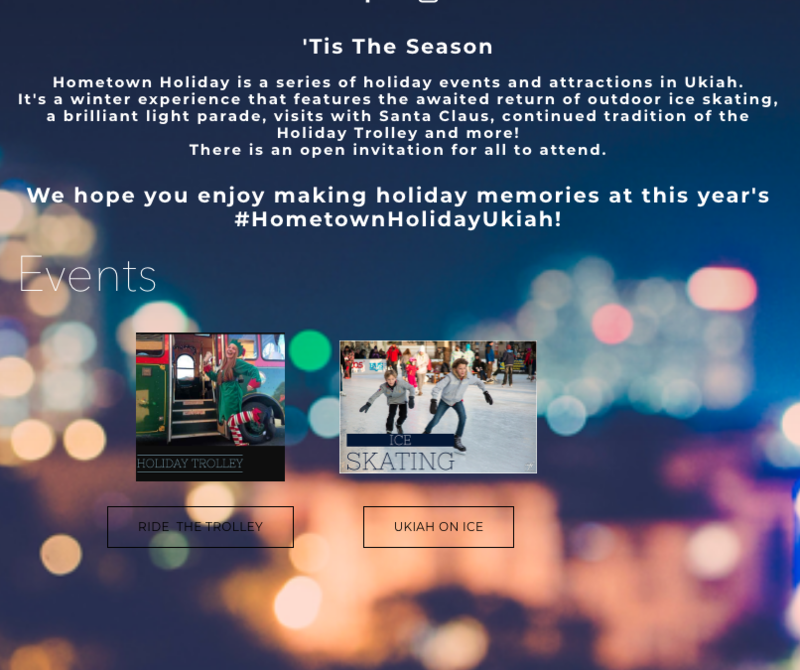 Hometown Holiday is a series of holiday events and attractions in Ukiah. ​There is an open invitation for all to attend.